Use the iPad Dock Connector to VGA Adapter to connect an iPad to your television, projector, or VGA display. Then see your videos and slideshows on the big screen. 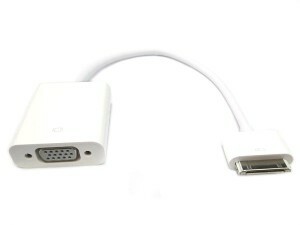 The iPad Dock Connector to VGA Adapter connects to your iPad or iPad Dock via the dock connector and to your projector or display using the VGA adapter.